New York - The owner of a Brooklyn bulb company is hoping to shed some new light on an ages old problem with a rabbinically approved bulb that can be switched from full light to darkness without any halachic violations. 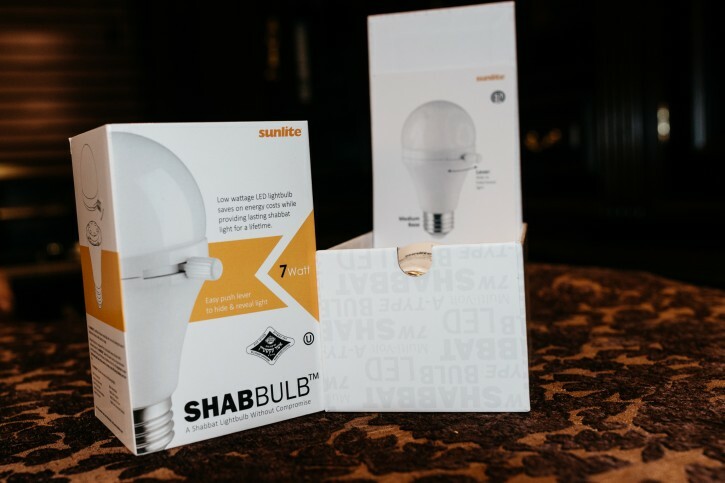 Morty Kohn, the owner the Redhook based Sunlite which stocks approximately 9,000 different bulbs and lighting fixtures, said that the idea for the Shabbulb had been brewing in his head for many years. As LED lighting began gaining in popularity, he saw the opening he had been looking for. It took Kohn, a 55 year old Borough Park resident, two years to bring his vision to life. The resulting Shabbulb is comprised of two distinct parts: a base containing the LED components that screws into a standard light fixture, and a removable cover whose horizontal shade controlled by an outside lever. Sliding the lever in one direction opens the shade, allowing the light to shine through the top of the bulb, while moving it the opposite way closes the shade, keeping the light confined to the base of the bulb. Leaving the level in the middle position gives the Shabbulb the ability to work as a dimmer. Separating the bulb into two distinctly separate components was an extra level of stringency incorporated into the Shabbulb design to make it acceptable to an even wider audience within the Jewish community. 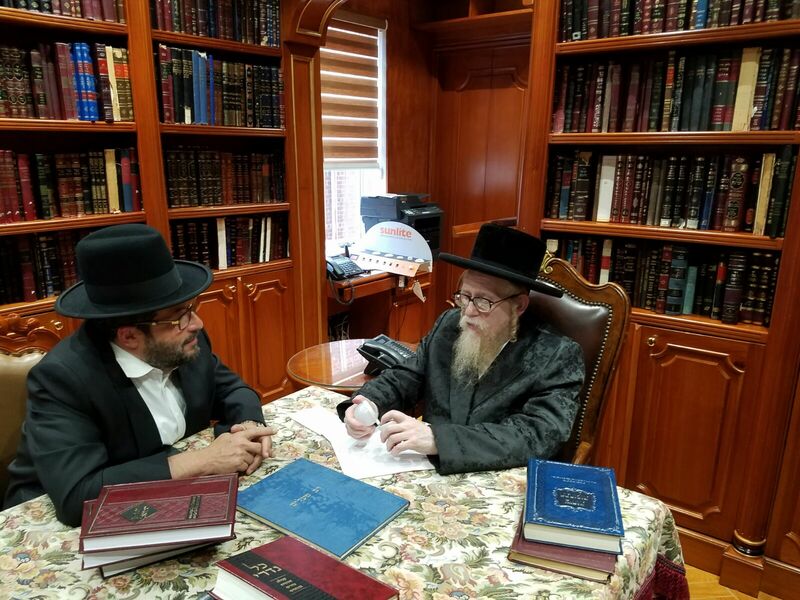 The seven watt Shabbulb bears the rabbinical endorsement of Rabbi Usher Eckstein of Vaad Hakashrus Machzikei Hadas and the Orthodox Union and has also the approval of Rabbi Asher Zelig Weiss, Rabbi Yisroel Duvid Harfenes and Rabbi Mechel Steinmetz, the Skverer Dayan. In response to an inquiry from VIN News, Rabbi Eckstein’s office sent an email on his behalf saying that the concept of covering a light source to darken a room is brought down in the Gemara, which discusses covering a burning candle on Shabbos. The Shabbulb’s sliding lever does not fall into the category of muktza because both the lever and the cover can be completely removed from the base which houses the bulb. The Shabbulb is completely permissible for the general population, according to Rabbi Eckstein. “This cover may be used by everyone and is not limited to the sick and old. It is muter lechatlichilo for everyone,” noted Rabbi Eckstein. The Shabbulb retails for $24.99 and will be available for sale on September 29th on the Sunlite website and Amazon. 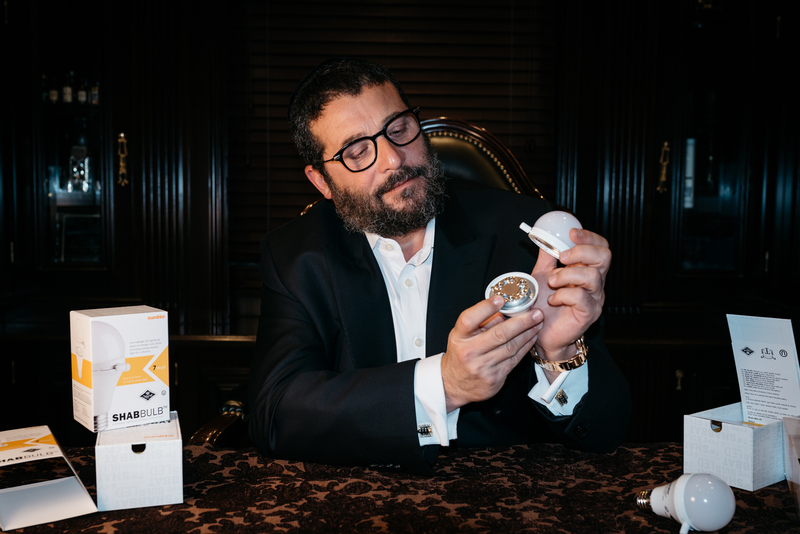 Kohn said that the bulb, which can work with both 110 and 240 voltage and is only intended for indoor use, will also be available worldwide in Judaica stores and major kosher supermarkets. The bulb bears the safety seal of the ETL which certifies that it complies to North American safety standards. The expected life of the Shabbulb is 10,000 hours, according to Kohn. The Shabbulb is not the first Shabbos light source market to the kosher consumer. As previously reported on VIN News (http://bit.ly/2d7MAyq), the Kosher Lamp, an upright lamp with a movable shade, debuted in 2004. A 2008 New York Times article reported that tens of thousands of Kosher Lamps had already been sold. Creating the Shabbulb was a labor of love for Kohn who said the product was never intended to be just another product in his inventory but rather a useful tool for Orthodox Jews, who could have a small, easily transportable light source that takes up minimal space and still produces a beautiful white light. How is this different than the kosher lamp??? The Kosher lamp is a stationary object that you need to take out before every shabbos. The bulb on the other hand, gets put into your regular lamp, which is used throughout the week. No need for the separate lamp now. Brilliant idea! Need to stock up on a couple for my house. You no longer need that heavy ugly fixture. You get the bulb, and use your own fixture. Genius. You get to keep your nice lamps. No more ugly "Shabbos lamp". It's a Mitzvah to have light in every room. This is good for traveling. When you go to a hotel you can take it along. The only aveira over here is the price. First the "Kosher Switch," now this. “ Genius. You get to keep your nice lamps. Since this bulb is LED it lasts way longer then the kosher lamp. So no hassle in changing the bulb... as it will last you a while! About using it in a regular lamp, if you will be touching the lampshade, there might be a shailah of muktzah. You seem to be privy as to the cost of manufacturing and distributing the bulb, so please elaborate why the price is wrong. Do you think this is for ceiling fixtures? You won't replace it very often. LED lights last MUCH longer than incandescent lights and even longer than fluorescent lights. Just don't forget to turn on this LED bulb before Shabbos starts or you will still be missing the toilet seat in the dark as usual. I happen to feel that the Shabbos lamp is a nice holder. It seems that the Shabbos lamp is easier to use then this bulb. The Kosher Lamp is convenient to use, it's sits on the night able and you just give a twist. It uses CFC bulbs which also last quite a while. To use this, either the bulb has to be exposed or you have to do all sorts of contortions to switch it around and under the lamp shade. And that is assuming there is room for the little switch in the fixture. It would seem to me that there are limited uses for this. But I wish the designer Hatzlocha. The innovation was the kosher lamp. From there I knew it's only a matter of time this idea will be implemented on larger fixtures etc. I couldn't agree more. I have a special Shabbos cave I live in for the entirety of Shabbos for the sole purpose of not exposing myself to the wonderful technology that makes me enjoy the holy day even more. You're welcome to come join me and enjoy the delicious stale crackers I have stored there. Genius, nothing has been innovative since sliced bread and the wheel. This bulb will last longer than your iPhone, computer, or for some sobriety. A price point of $24 for years of controlling my light on Shabbos and yom tov is a great investment. If he did it for "The Klal" does that mean he is selling it at cost and not making anything on them? That is, after all, what it would imply. Yes, a shade with goes over the TV and blocks the remote signals too. Works only with TV that use close caption! Twist the window louvers and see TV with closed captions, another twist on window louvers and see a blank windows shade. Totally detachable from the TV. Mr. Kohn says, “Because LED bulbs rely on a chemical reaction, it isn’t really considered to be aish, so I knew from a technology standpoint it would be much easier,” LED light is not caused by a chemical reaction. The current passing through the Light Emitting Diode causes release of energy from the individual atoms in the form of photons. His statement that "...isn't really considered to be Aish" begs the question: What is the halachic definition of aish and why modern electical devices do or don't meet the definition? Did you read the article or study the gemora? "Rabbi Eckstein’s office sent an email on his behalf saying that the concept of covering a light source to darken a room is brought down in the Gemara..." Would you say that about this gemora as well? Personally, I think the kosher lamp looks nice and is good, but having options for different circumstances is also good. The way I see it the big problem with the kosher switch was it's marketing Yes the rabbonim will never admit it but they don't paskan strictly on halacha. The rabbonim like to throw in hashkafa too. The kosher switch was marketed as a way to get around the difficulties of shabbos observance. Furthermore and even more annoying to rabbonim was it's commercial content not being the most tznuis in style. Its similar to the kashrus market. Stores that promote their products in untznuis fashions or provide entertainment are shunned from the community even if they withhold the strictest kashrus laws. Judaism is all about marketing. But it is a great idea. It seems like it should be made a little brighter. Really? Led 7 watts can give off around 60 watts of power. So plenty of light. The guy who invented the wheel was an idiot. The guy that invented the other 3.... now THAT was a genius! “ Next -The Kosher TV! Next comes the Kosher Iphone! 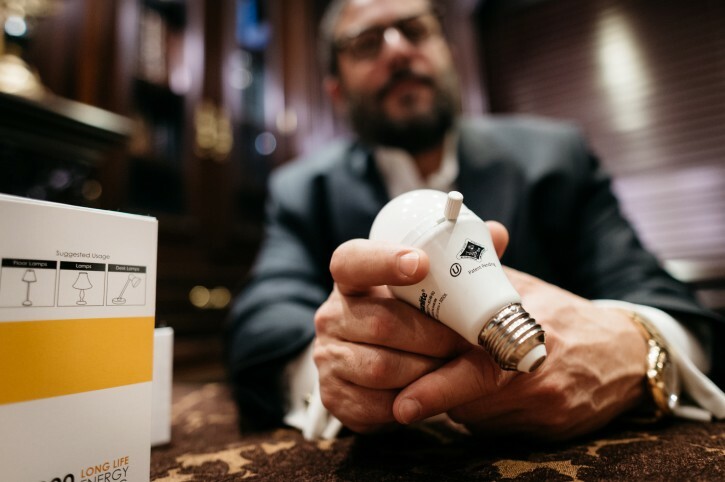 “ Mr. Kohn says, “Because LED bulbs rely on a chemical reaction, it isn’t really considered to be aish, so I knew from a technology standpoint it would be much easier,” LED light is not caused by a chemical reaction. The current passing through the Light Emitting Diode causes release of energy from the individual atoms in the form of photons. Nothing is being turned on or off. The light is blocked by a special shade within the bulb. It works with led because no light is emitted through the base of the bulb. The light comes through the cover part. Additionally, the heat is low enough to be contained because LEDs are low heat and high efficiency. You can and watch it fry from the heat build up. In other words folks, this guy isn't happy that he didn't think of this. A nice variation/upgrade over the Shabbos lamp. It can be put in any night light and even in lamps. Obviously does not work for ceiling and sky lights unless you intend to climb up a latter and change all the bulbs which is an entire מלאכה for itself. For those complaining about the price, did you consider how much it costs to produce a quality LED bulb and then think it's only targeting a relatively small audience. Patent costs, advertising, the costs are enormous. whoop-dee-doo. So him you know him. big deal. what's that got to do with the article? Actually, being aish or not is totally irrelevant here. Even if it was eish, you could halachicly cover it, just practically speaking that wouldn't be a good idea, like that guy tzitis a"h! The reason why LED is not considered eish, is because eish is only actual flame or a red hot coal, or red hot metal, like the old fashioned bulbs.